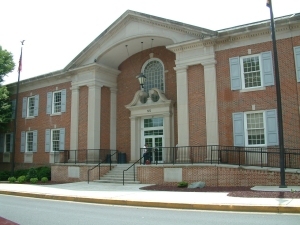 The Circuit Court for Carroll County, located in Westminster, Maryland, is part of the Fifth Judicial Circuit, which also includes Anne Arundel and Howard Counties. It is a trial court of general jurisdiction, which handles juvenile and family law matters, as well as all major civil cases and serious criminal matters. The Circuit Court also has appellate jurisdiction over the District Court and certain administrative agencies. In addition, it has full common law and equity powers and jurisdiction in all civil and criminal cases within the County, and all additional powers and jurisdiction conferred by the Constitution and by law, except where, by law, jurisdiction has been limited or conferred upon by another tribunal. The mission of the Circuit Court for Carroll County is to serve its residents in the determination of litigation in serious criminal matters, substantive civil cases, domestic and child support cases, in accordance with the Constitution, while administering justice in an honest, fair and efficient manner.